Music for two keyboards is pretty rare, especially from the pre-romantic period. That is easy to explain. A substantial part of keyboard music was written for amateurs, and very few of them could afford to own more than one keyboard instrument. This kind of music was also not of interest for professionals because public concerts were rare before the mid-18th century. There was simply no demand for such music. 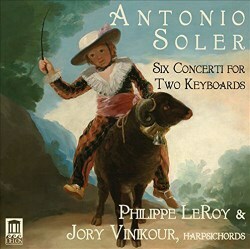 Pieces for two keyboards were written for a specific reason, or, as in the case of Soler's Concertos, for two specific persons: the composer and his employer. Antonio Soler entered the choir school at Montserrat at the age of six. It was then one of the best musical academies in Europe. He studied organ and composition and seems to have been a brilliant student. In the late 1750s he became chapel master at the Escorial, to the north-west of Madrid. This resulted in a close connection to the royal family which used to spend each autumn there. It allowed him to take lessons from Domenico Scarlatti who was in the service of the court. In 1766 Soler was appointed music tutor to Crown Prince Don Gabriel de Borbón, who was very talented and collected a large number of keyboard instruments. One of these was a rare vis à vis organ which was housed in the basilica of El Escorial. "A specially made instrument featuring two consoles on opposite sides of a single cabinet containing the pipes and bellows, the organ's configuration enabled a pair of musicians to play simultaneously", Joseph Newsome explains in the booklet to the present recording. Obviously one is inclined to think that these concertos were written for this instrument, especially as their title refers to the organ: Seis Conciertos de dos Organos Obligados. There is one problem: the compass of the organ is largely identical with what was common at the time, but "Soler's writing covers an exceptionally wide range". However, the fact that the collection is dedicated to the Infante indicates that these concertos were written for performances by him and his teacher. It seems more likely that they were performed them on harpsichords. The range of these concertos, FF to G''', points in that direction: Domenico Scarlatti wrote some sonatas which explore this range and that indicates that the court owned at least one keyboard with this compass. These concertos which probably date from around 1770, consist of two movements, except the second which has three. The first is in binary form and in a moderate tempo, mostly andante. The opening movement of the Concerto No. 6 is divided into four sections: allegro, andante, allegro and andante. The closing movement is always a minuet, not in the then common form of menuet and trio - except in the second concerto - but as a series of variations, in the tradition of the diferencias which goes back as far as Cabezón. The second movement of the Concerto No. 2 is an allegro in the form of a gigue. Dance rhythms frequently appear in these concertos which are written in the galant idiom. The first part has been preserved in manuscript. It is the most difficult part and it is assumed that this was intended for the Infante who by all accounts was a brilliant player. The solo episodes allowed him to show his skills. The second part has come down to us in a copy. The dialogue between the two keyboards differs from one movement to the other. The menuet from the Concerto No. 1 is dominated by repetition: the statements of the first keyboard - sometimes only a couple of notes - are repeated by the second keyboard. In the allegro from the Concerto No. 2 we find pasages in unison. The opening cantabile from the Concerto No. 5 is a true dialogue in which the two keyboards have different material. In the ensuing menuet the first keyboard plays a variation which is then repeated by the second. The best-known concerto is the third, undoubtedly largely because the menuet with variations is the most technically brilliant movement of this set. In second place come the menuet and variations of the sixth concerto. Considering that the Infante had a large collection of keyboard instruments it is not easy to decide which instruments suit these concertos best. Philippe LeRoy and Jory Vinikour play two harpsichords of the same builder, John Philips from Berkeley (California) which are based on Florentine originals. This is not the only plausible choice, but this recording indicates that they are probably musically the most satisfying option, also because there was little difference between Italian and Spanish harpsichords at the time. Pieces for two harpsichords are always in danger of being too noisy and short of transparency but that is avoided here, thanks to the choice of instruments - which have only one manual and only a few stops - and the excellent playing of these two harpsichordists. The good recording allows the listener to tell the two keyboards apart, but fortunately the division between left and right has not been exaggerated. Another nice feature of this recording is that all the repeats are observed which explains the long playing time. Other recordings I know - and there are quite a number in the catalogue - are mostly (much) shorter. All in all, this is the most satisfying interpretation of these concertos that I have heard.